(April 1, 2013) SANTA BARBARA, CA. The Surfing for Life Foundation continues traveling to surf shops around the country to talk about the importance of being pro-active in the fight against cancer. Tom Brown, executive director of the Surfing for Life Foundation, sends his heartfelt thanks to all of the many supporters around the globe who continue sending notes of support, encouragement and gratitude. SFL continues to move forward with their mission of bringing cancer awareness to the surfing community. The challenge of running a grassroots non-profit is getting the word out and fundraising. The Surfing for Life Foundation’sretail partners have been doing both,distributing the wristbands to the surfing community and sharing SFL’s mission to educate. The Surfing for Life Foundation is thankful to have retail partners with a personal commitment to the cause. 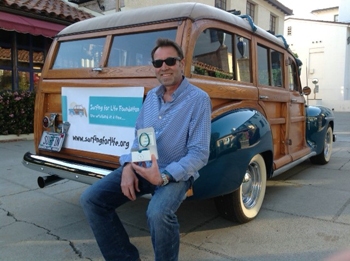 This past quarter the Surfing for Life Foundation traveled up and down the California coast from San Francisco to San Diego. Along the way they welcomed two Santa Cruzsurf shops to the list of donors, Noland’son the Wharf and Covewater SUP. The San Diego region welcomed Bird’s Surf Shed, SurfySurfy, and Progression Surf to the expanding list of shops.“We’re stoked to announce the addition of surfers Gary Elkerton,Felipe Pomar, andHawaiian big wave riderJamie Sterling to our list of ambassadors helping to spread the cause”, states Brown.